In a recently published paper titled “What do we think we are doing? How might a clinical information network be promoting implementation of recommended pediatric care practices in Kenyan hospitals?” Mike English and colleagues describe a clinical information network (CIN) that was implemented as an intervention to improve district hospital services for children in Kenya and also describe how the CIN may have promoted the use of recommended clinical practices for inpatient pediatric care. The CIN intervention was based on four main strategies, described here. As part of the CIN, pediatricians were equipped with simple management skills to improve engagement with senior managers and frontline staff, as well as episodic feedback on their care provision. 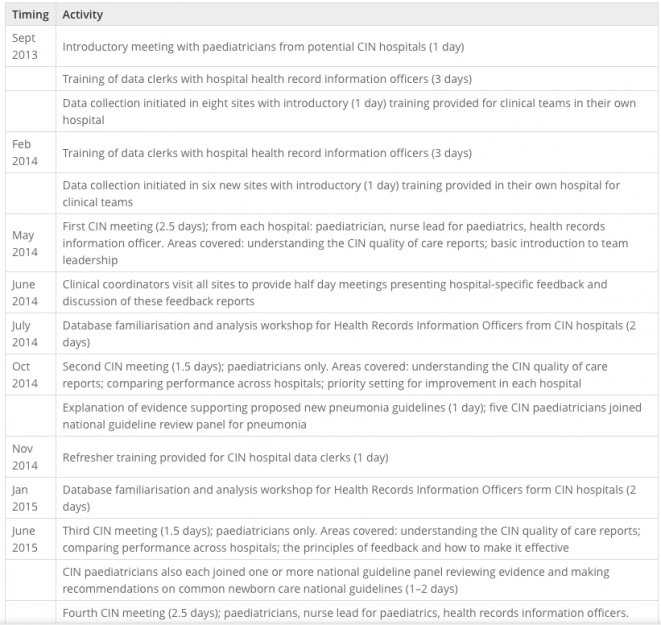 An excerpt of major CIN activities conducted between September 2013 and April 2016 are included above; for the full list see Table 1 of the original article. Using a Behavior Change Wheel, English et al. found that the network likely comprised of 22 of 73 identifiable intervention components. The authors concluded that the 22 intervention components may have influenced pediatrician behaviors including perceived capability, new social opportunity, and increased motivation. It is anticipated that findings from this research will complement a planned independent evaluation of the overall intervention. This piece has been published under the Creative Commons License Attribution 4.0 International. For the full article, please click here.